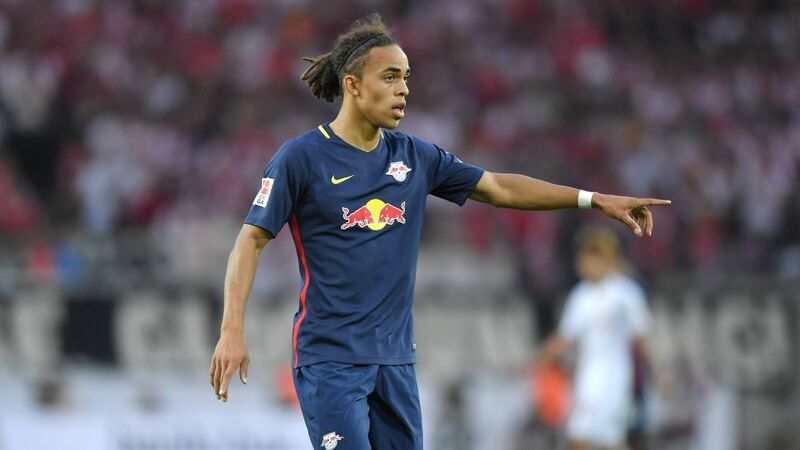 Unbeaten Bundesliga newcomers RB Leipzig are riding a crest of a wave at present, and Yussuf Poulsen is loving every minute of it. In an exclusive interview with bundesliga.com, the 22-year-old Danish striker discusses his side's smooth transition to the German top-flight, the accelerated development of former Leipzig roommate Joshua Kimmich and Friday's Matchday 6 clash with FC Augsburg. Add Leipzig's Yussuf Poulsen to your Official Fantasy Bundesliga ranks now! bundesliga.com: Yussuf Poulsen, RB Leipzig appear to have settled into the Bundesliga a lot quicker than the experts expected. Are you surprised how well it's going? Yussuf Poulsen: We're a bit surprised - we didn't really expect to make such a good start. Nine points from five games is a good start. Now we have to keep it up and play as we did in the opening games. Poulsen: It wasn't just my decision. My mother also had a big say in it. Still, it was very important to me to finish school, before focussing on football and turning professional. I think it worked out well. Even though I missed a bit of school because of football, I got good results in my exams. I'm happy I was able to do that. Maybe I'll have the chance to study again. "I don't see any reason why we won't continue to play as we have in the first five matches of the season." bundesliga.com: One of the first people you got to know in Leipzig was Joshua Kimmich, who you shared a flat with. What do you make of the progress he's made at FC Bayern München? Poulsen: We're still in touch and I'm going to go and visit him in Munich this weekend. Joshua has taken incredible steps in his development since I first met him. He was still a youth player when he came to Leipzig. Since then, he's learned an incredible amount and taken his performances to a new level that many will never reach. His performances are really impressive, be it for FC Bayern München or Germany. bundesliga.com: Before you head off on your travels, there's a game against FC Augsburg. Are you expecting a win? Poulsen: As a promoted club and in professional football in general you can never expect to win before the game has begun. We want to play to the level we have in the first five matches of the season. If we're able to do that, we have a great chance of getting something from the game. I certainly don't see any reason why we won't play as we have in the first five games on Friday. bundesliga.com: Augsburg were uncomfortable to play against under Markus Weinzierl, and not much has changed under Dirk Schuster. What kind of game do you expect? Poulsen: Augsburg are a strong team with players who run hard and don't shirk a challenge. I'm expecting a tough game and would imagine that Augsburg, as the away team, would be happy with a point. They'll probably play fairly defensively, and that won't make it any easier for us, but I'm sure that the coach will prepare us really well for the opposition.